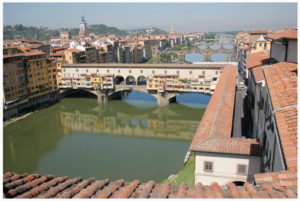 One of the most memorable thing you can do in Florence is to visit Vasari Corridor. Some people do not understand where this wonderful secret corridor of the Medici family is. In fact it is not simply visible and it is also not simply accessible for security reasons. The Vasari Corridor is an enclosed private passageway long approximately 1km built in 1565 in just five months by order of Duke Cosimo I de’ Medici. The total design is planned by Giorgio Vasari, from which the corridor has taken its name. Duke Cosimo I de’ Medici has ordered to build this passage at the time of the wedding between his son Francesco I de’ Medici and Johanna of Austria. He especially wanted to be able to move freely between his residence, Pitti Palace, and the government palace, Palazzo Vecchio. In fact, since he had replaced the Republic of Florence, he felt insecure in public. The meat market on the bridge Ponte Vecchio was then replaced by goldsmith shops (that still occupy the bridge until now) to avoid its smell reaching into the passage. On the other side of the Arno, the corridor passes over the loggiato of the church of Santa Felicita until it finally reaches the Boboli gardens and the apartments in Pitti Palace. 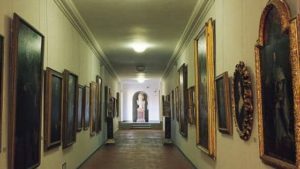 The secret passageway contains over 1000 paintings, all dating from the 17th and 18th centuries, as well as the important collection of Self-portraits by the greatest Masters of Western Art, like Giorgio Vasari, Andrea del Sarto, Bernini, Canova, Delacriox, Chagal and many others. The Vasari Corridor can only be visited through guided tours organized by travel agencies and the costs are a little bit expensive. However, it will surely be worth the visit! If you want to visit the Vasarian Corridor with a private guide, check out our Guided Visits in Florence!